It is not always easy to get a full week off work, but Sanctuary Surf's Long Weekend Glamping, Surf & SUP trip in France is the perfect solution. South West France is the perfect place for you to get your dose of vitamin D, get back in the water and give surfing and/or Standup Paddle Boarding (SUP). Sanctuary Surf team has the whole weekend organized to make sure you get the most of your precious time away. Sanctuary Surf is highly flexible, so get in touch and they'll do their utmost to make it happen! You will sleep under luxury canvas on Egyptian cotton and memory foam with your own private bathroom (toilet and sink) and terrace. Following a perfect day at the beach and a spot-on meal on the decking under the stars, fall asleep to the sound of silence, wake up to the sound of the birds, roll off your king size memory foam mattress and slide back those Egyptian cotton sheets, don your shades as you open the awning of your private 24 meters square / 250 feet square “Ultimate Emperor” bell tent, and step out onto the decking where breakfast will be served. You can always pop to the loo first of course, but you will have to take the side entrance to your private WC with a full-size toilet seat and electric flush. A king (or queen) upon the throne. Other facilities include shaded area, outdoor seating area and tables, storage, cozy, and romantic solar powered indoor and outdoor lighting, USB solar charging points, Wi-Fi, and towels. Sanctuary Surf has a maximum of four tents which means up to 12 guests can stay comfortably on site at any one time. This is an example itinerary and everything can be adapted to suit your individual needs. Get in touch and let Sanctuary Surf know what you want. Dash out of the office and get yourself to the airport in time for the evening flight to Bordeaux. Step outside the airport into a warm Bordeaux breeze where you will be greeted by one of the Sanctuary Surf team upon arrival. Jump in the van and enjoy a short cruise through the vineyards to Sanctuary Surf. Unpack and enjoy a late supper of charcuterie and cheese followed by a glass of Bordeaux’s finest. Hit the sack in your private lodging and drift off to the sound of silence. You will wake up to breakfast served on your private terrace ready for a full day ahead of you. Grab your beach bag and wetsuit as you are hitting the beach for your morning surf session. Enjoy the waves and soak up the vibes on plage ‘Le Pin Sec’ and then jump in the surf bus as Sanctuary Surf cruises you back to Sanctuary Surf for lunch. You will enjoy the lunch served on the terrace and obviously the post-lunch chill. Then, you will back to the beach for another surf and head back to Sanctuary Surf where you can wash off that saltwater under a lovely hot shower and enjoy an aperitif. Dinner is served on your communal table where you can recount your tales of surfing legend. After, enjoy a nightcap, board game, or film on the projector before getting a good night rest. Same as Friday, why change a winning formula? Although, it can be better; post afternoon Apéro on the beach followed by dinner at a local beachside restaurant (Au Pin Sec and à l'Eau) with the best views in Naujac-sur-Mer. Watch the sunset disappear across the horizon over dinner before being ferried home by yours truly for a nightcap and stargazing back at camp. You will wake up early then hit up the local gem that is Montalivet market. You’ll see how the locals do and enjoy some oysters and white wine while shopping for some locally crafted souvenirs to take back home. For lunch, you will head into the nearby pine forest that runs along the beach for a cool picnic lunch and you will stay 'Monta' for your afternoon surf before whisking you back to the Sanctuary Surf to get freshened up before it is, unfortunately, time for you to head back home. Jump in the van and Sanctuary Surf will drop you off at the airport ready to take your late afternoon flight back to the real world. During the program, you will have an excursion to Montalivet market. It is an absolute must if you are down in this corner of the world. See how the French locals do and enjoy the hustle and bustle of the market offering delicious snacks and handmade souvenirs.. This surf camp is located in Lesparre-Médoc, France. Nestled between the estuary and the ocean, the Médoc is not only the world's most famous wine region but also has endless golden sandy beaches that run down to Spain. At its heart in the middle, you can find France's largest freshwater lake surrounded by pine forests. The local spot only five minutes down the road is Plage du Pin Sec, the region's quietest public beach with only a few amenities preserving the wild vibe. Sanctuary Surf is graced with the same waves that hit other legendary spots such as Lacanau, Hossegor, Biscarosse, and Biarritz on the same stretch of coast. The South West of France is home to the country's most dynamic and popular yet uncrowded cities, its longest beaches, and the best wine in the world. The French cuisine served during your stay will be freshly prepared, locally sourced and cooked outdoors on plancha and wood-fire kitchen. In France, you live to eat and at Sanctuary Surf, it is certainly no different with food taking pride of place. The chef cooks up a daily rotating French-rooted menu with the odd twist from the travels. Start each day with tea or coffee and juice served on your lodging’s private terrace followed by a big and varied breakfast with daily hot options, ensuring you will be ready to hit the beach. Lunch is always served on the terrace or as a picnic, a fresh but hearty affair giving you energy for the afternoon but leaving enough of room for the evening’s communal banquet. Please book your flight to arrive at Bordeaux-Mérignac Airport (BOD). Transfer from and to the airport is included. The organizer will pick you up from the airport. Arrive at Gare Saint Jean in Bordeaux and Sanctuary Surf will come to collect you. You can also get a bus to Lesparre in Le Médoc. The closest train station to the surf camp is Lesparre. Arrive there and Sanctuary Surf will come to pick you up and drop off to the camp. A pick up can also be arranged from Gare Saint Jean in Bordeaux. Airport: Bordeaux–Mérignac Airport Airport transfer included: Bordeaux–Mérignac Airport No additional charges. You can request this in the next step. 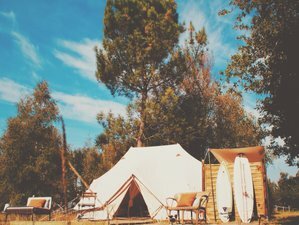 Sanctuary Surf provides the perfect summer holiday, the only surf camp offering the hotel experience under canvas and showcasing the best France has to offer. This vacation is available every Thursday from June to August, please select an arrival date below. If you would like to extend your stay with SanctuarySurf from three nights to four or five, you may book them for an additional fee of 99 EUR per night per person.